George Nikias is a graduate of New York Medical College. He completed a residency in Internal Medicine at North Shore University Hospital and Memorial Sloan-Kettering Cancer Center followed by a fellowship in Hepatology at the Mayo Clinic in Rochester Minnesota and a fellowship in Gastroenterology at Memorial Sloan-Kettering Cancer Center. Dr. Nikias has received numerous distinctions, incl uding being named one of the metro area’s Top Doctors by Castle-Connoly every year since 2007. He was named to the list of Top Doctors in Gastroenterology by New York Magazine in 2014. His areas of expertise include advanced endoscopy, including ERCP and Endoscopic Ultrasound with Fine Needle Aspiration as well as the management of complex liver disease. It is Dr. Nikias’ belief that an individual’s understanding of their illness is the first step in achieving wellness. 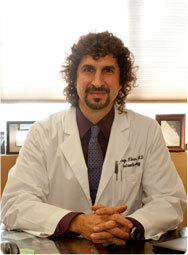 He looks forward to educating his patients and helping them realize optimal digestive health. Call us at 201-489-7772 if you have any questions or would like to schedule an appointment. Colon cancer screening can detect polyps and early cancers. These screenings can find abnormalities that can be treated BEFORE cancer develops or spreads. CALL TODAY TO SCHEDULE AN APPOINTMENT AT 201-489-7772.